A tour of Paris by bus with sensational views from the panoramic terrace of the Arc de Triomphe! The Panoramic Tour combines a touristic ride on board an air conditioned bus and entry to the panoramic terrace of the Arc de Triomphe. All this is on offer at a truly competitive price of just €30.00! Hurry up and book this tour so that you can visit the French capital easily and in a really memorable way! In addition to this, with the help of an Audio-Guide, (which is available in English), you will have the chance to broaden your knowledge of the historic details and idiosyncracies of the Parisian way of life. Click now on the "Book a Panoramic Tour" and make sure that you have a seat. A Panoramic Tour is the perfect solution for anyone who is visiting the French capital for the first time. 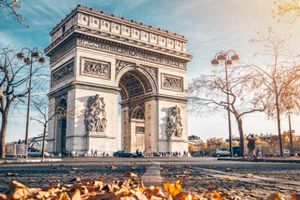 In fact, combining entry to the iconic Arc de Triomphe with a tour on board a sightseeing bus means that you will have the chance to see some of the most beautiful attractions in Paris quickly and easily. Forget about the tedium of having to count out your coins for a bus fare. Forget about the darkness in the metro and the numerous changes you would have to make: choose a bus with routes that have been specifically selected to show you the wonders of Paris in a completely relaxed way. This monument, which was the dream of Napoléon, is one of the most prestigious monuments in the city today and is visited by thousands of tourists every year, not just because of its majestic structure and the beauty of its architecture but also because of its viewing terrace on the top of the building (some 50 metres above the ground). Although you will need to climb about 100 steps, your time and effort will be generously rewarded when you reach the top and can admire spectacular views of Paris from on high as they stretch out before you. A major plus point of this tour is undoubtedly the convenience! In fact, by booking this tour, you will be able to enjoy a good quality touristic tour of the city at an inexpensive price. Without doubt, the Panoramic Tour is ideal for those who have limited time, for those who are visiting the city for the first time and for those who love the idea that the view they are seeing will literally take their breath away! Audio-Guides are available in Spanish, English and Italian.